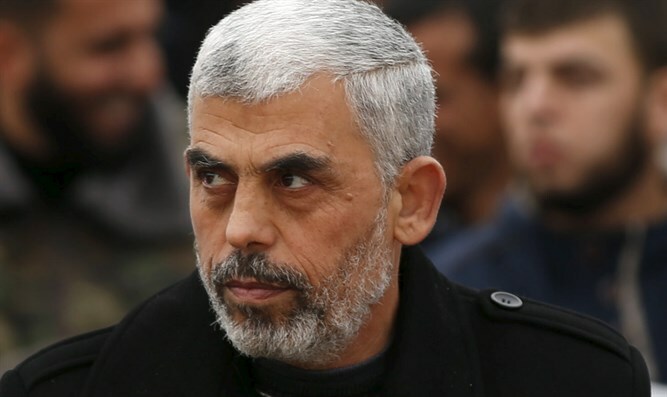 Hamas leader in Gaza: We can strike Israel for 51 minutes at the same level that we attacked Tel Aviv in 51 days. Hamas's leader in Gaza, Yahya Sinwar, is continuing his rhetoric against Israel and the Palestinian Authority (PA), stressing on Tuesday that the weapons held by the Al-Qassam Brigades, Hamas's “military wing”, will continue to serve as the spearhead in the struggle for the liberation of Palestine. In a meeting with representatives of labor unions on behalf of the Palestinian Arab organizations, Sinwar said that "the Palestinian people are still at the stage of national liberation and cannot give up their weapons." He added that the decision on national reconciliation was made by a consensus of Hamas leaders inside and outside “Palestine”, and stressed that the movement was serious about its intentions regarding the reconciliation agreement with Fatah. Sinwar explained that Hamas could not allow the continuation of the split with Fatah because it is a huge and strategic problem for the Palestinian national enterprise. He then sent a threatening message about Hamas's military capabilities, saying, "We can strike Israel for a period of 51 minutes at the same level that we attacked Tel Aviv in 51 days." Israel rejected the unity agreement due to the involvement of Hamas, an internationally recognized terror organization. Last week, the Israeli Cabinet made clear that it would not negotiate with the new Palestinian unity government until Hamas recognizes Israel, disarms, and severs its ties with Iran. Hamas, in blatant disregard of the Israeli statement, sent a high-ranking delegation to Iran, where its deputy leader, sanctioned terrorist Salah Al-Aruri, declared that the group would never agree to sever its ties with Iran and give up the armed struggle against “the Zionist regime”.